As Canadians we don’t all naturally embrace winter. 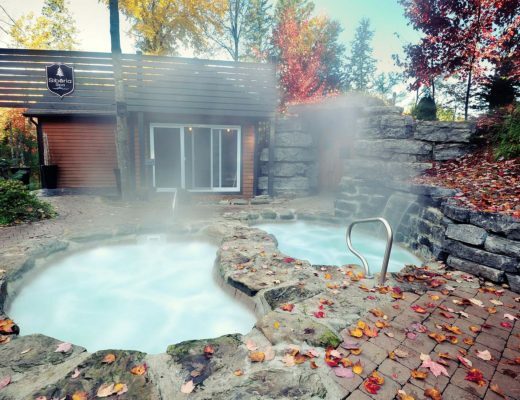 In fact, you can usually find me hibernating within the four walls of my apartment as soon as the weather gets cold. But for about two weeks each winter, Québec City not only embraces the season but celebrates it at their Winter Carnival—the world’s largest, and ranked as one of the top carnivals next to Rio, and New Orleans. Québec City saw its first Carnaval de Québec in 1894, but it wasn’t continuously celebrated until 1954 because of interruptions from wars and the economic crisis of 1929. Starting in 1955, the first Winter Carnival took place after a group of business people re-launched the festivities. Today the carnival plays an important role in tourism and economic activity for the city, bringing in thousands of visitors from near and far for the celebrations. This past weekend I had the chance to attend my first ever carnival, and despite my lack of love for the winter season and being cold, it was next to impossible to not embrace the day of winter activities. My day started off bright and early as I headed over to meet someone I had been fangirling over the entire weekend—Bonhomme, the carnivals ambassador who was born (appointed) in 1955. Bonhomme is the face of the entire carnival and you’ll see him all over the city, this jolly snowman seems to have the celebrity factor of Santa during the festival among those both young and old. 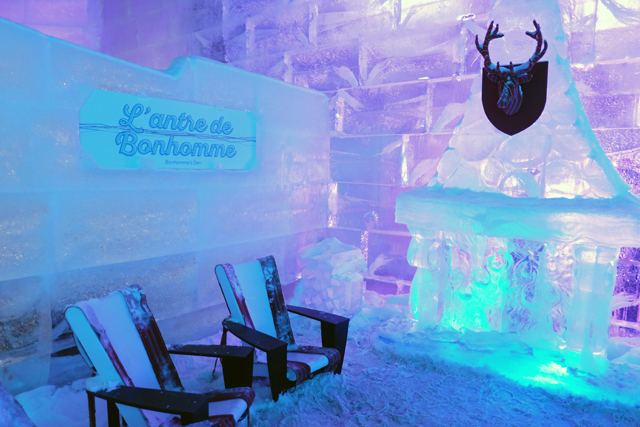 I met Bonhomme in his ice castle, which is designed and built to a different theme each year. This year the theme was the arrowed sash—a traditional sash worn around Bonhomme’s waist, and several carnival go-ers. You can walk through the castle and visit each room which tells the history of the sash, and also check out some pretty cool ice furniture including an ice pool table and couch. 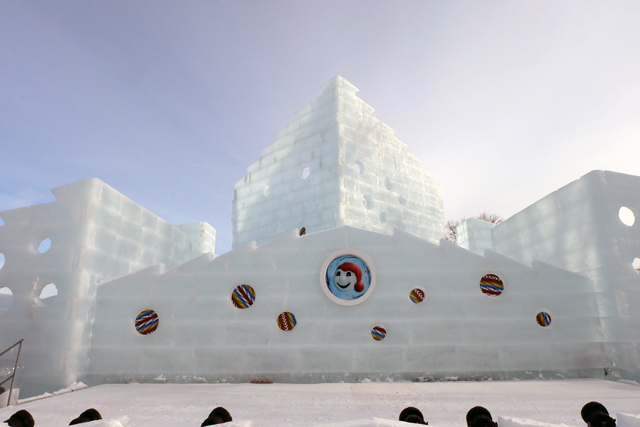 Visitors can visit the ice castle throughout the carnival with an effigy (pass). 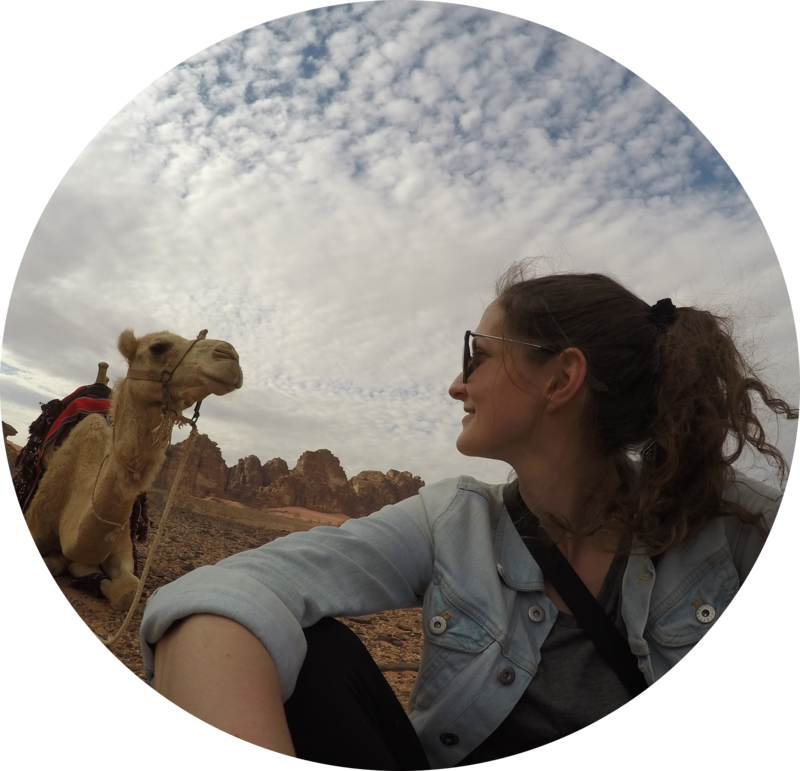 After my heart stopped racing from meeting the man of the weekend—Bonhomme, our group headed in to partake in some of the carnival activities. 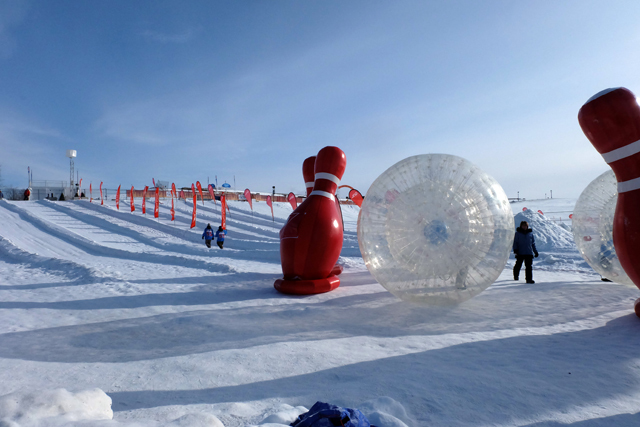 This year, a sponsor created giant bowling where you crawl into a giant transparent sphere and roll down the hill to try to knock over the bowling pins at the bottom. Believe me when I say that this looks way easier than it is! After summersaulting and getting thrown around within the ball, I was glad I tried it, but felt a bit dizzy and defeated. This activity is free with a festival effigy (pass). 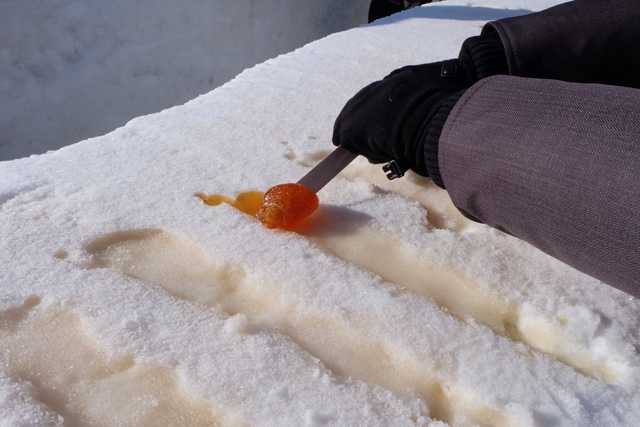 Following our experience in giant inflated spheres, we went to try some must-have maple taffy at the sugar shack which is poured on snow and after 30 seconds, rolled up on a popsicle stick for you to enjoy. You may feel like you need to get some cavities filled after this sugary maple treat! This activity varies in price. 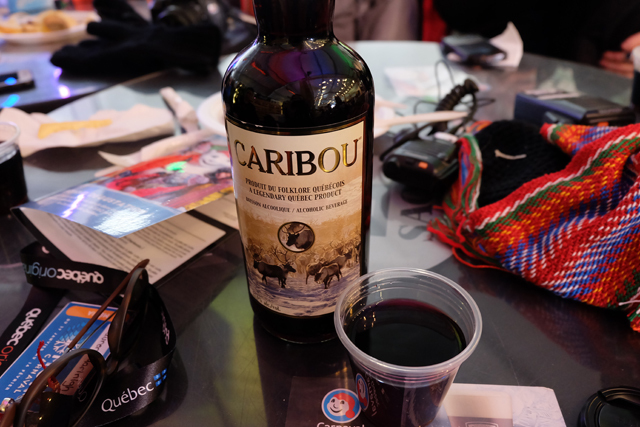 After stopping at one of the sites restaurants/bars to warm up and try my first glass of Caribou, a traditional Québécois beverage made of red wine, hard liquor such as whiskey, maple syrup and on occasion, spices, we headed back out to experience more activities. Fun Fact: Caribou can be purchased at several sites throughout the carnival, and even purchased in a Bonhomme themed walking cane which is hollowed and filled with the drink for around $30 CDN. Carnival is home to a few rides for kids and adults. This year it was the ferris wheel and super shot, a 27-meter high drop tower. Both these views give you an incredible view of Québec City and the festival grounds which are on the historical Plains of Abraham. Around the festival grounds, there are several fun activities for kids (and adults) including a play area, floor hockey, a climbing tower, zip-lining, tubing & tobogganing, ice skating, and even a giant foosball game. 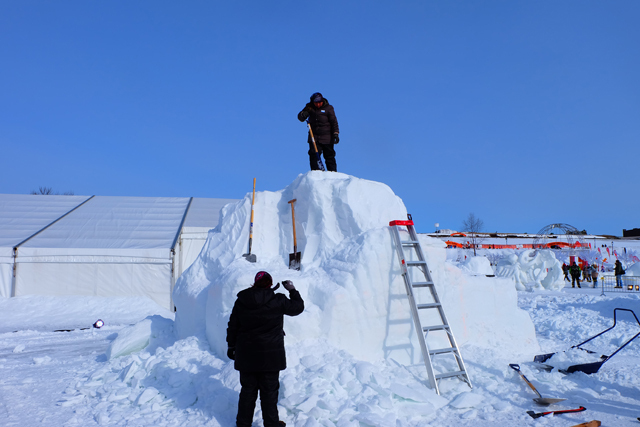 After riding the ferris wheel, and taking a stroll through the snow sculptors who were hard at work in the International Snow Sculpture Competition that had competitors from places as far as Mexico, France and Argentina, I opted for a dog sled ride. Now don’t get me wrong, this was a blast, but it’s a quick ride, and by no means can be compared to a real dog sledding experience, but I still had a lot of fun! 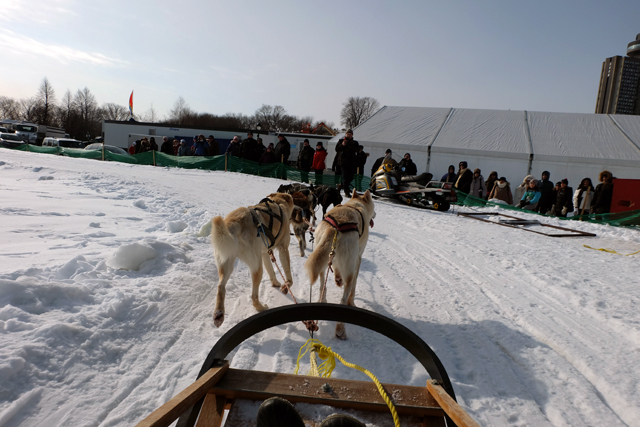 You have the option to even be the driver of the sled as the pack of 4-6 dogs speeds you around the track. This activity costs $10 for adults and $8 for kids with a festival effigy (pass). Before I left the festival grounds for some much needed fuel (aka poutine), I went on a little escape from the chaos on a horse drawn sleigh ride through the Plains of Abraham which took about 20 minutes. This activity is an additional cost with a festival effigy (pass). In the evening, we were lucky enough to be visiting the day of the Charlesbourg Night Parade. Throughout carnival there are multiple parades that take place around the city, to encourage as much of the community to get involved in the festivities. When I first heard I was going to a parade, I wasn’t that excited, I mean, I have been to a million parades in my life, but I was actually extremely impressed! 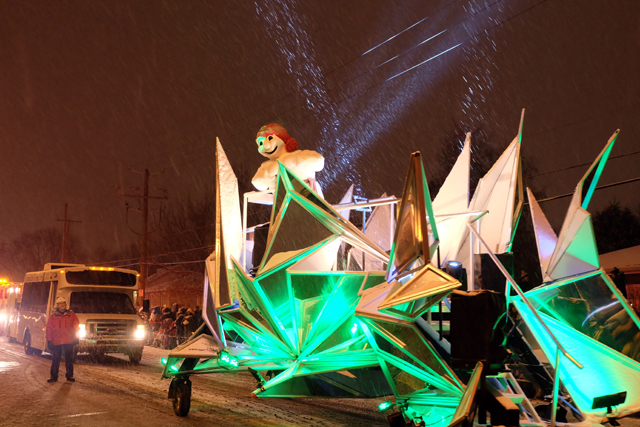 Not only did we have a beautiful snowy winter night with fluffy snowflakes, live music, floats, and costumes were incredibly entertaining and impressive. The parade also ended off with of course, an appearance from Bonhomme himself. This activity is free, no effigy (pass) required. After being hyped up on carnival spirit, I ended my night back at Bonhomme’s ice castle for a dance party, and to see the castle all lit up at night. 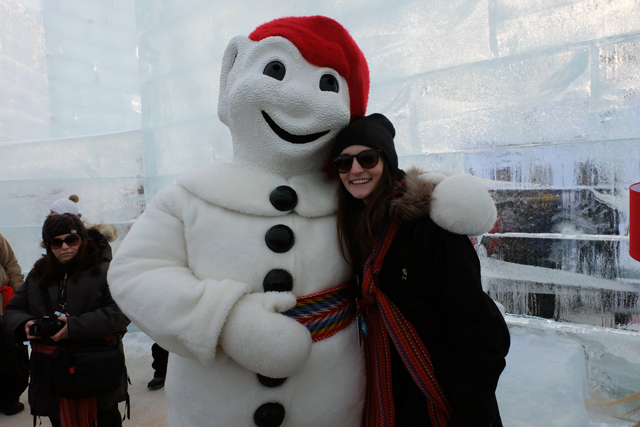 Overall my day of Winter Carnival activities in Québec City was absolutely unforgettable. 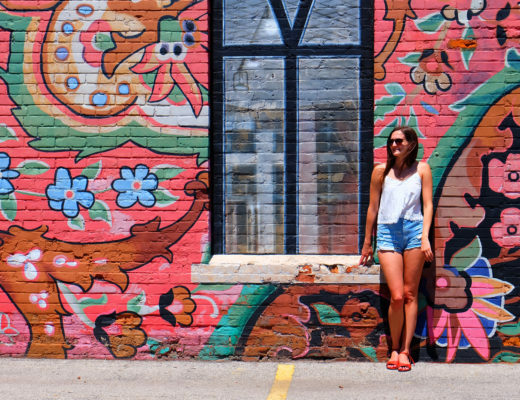 You can really see this city come together for this two week-long festival, and the enthusiasm for it brought the city alive. I can’t wait to attend my next Winter Carnival because I’m still smiling about my experience I had this year. 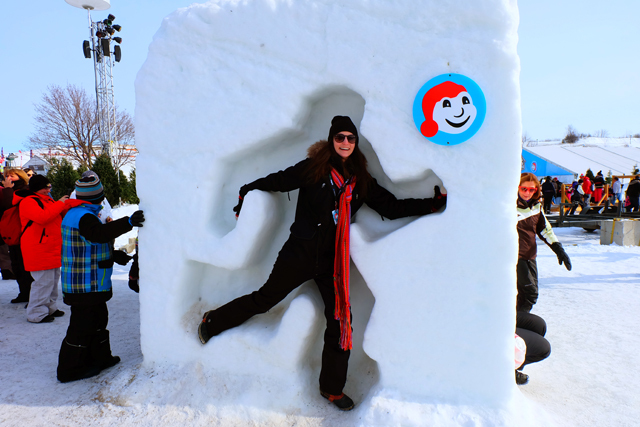 For more information on Québec City’s Winter Carnival, click here, to watch my video from the weekend, click here. 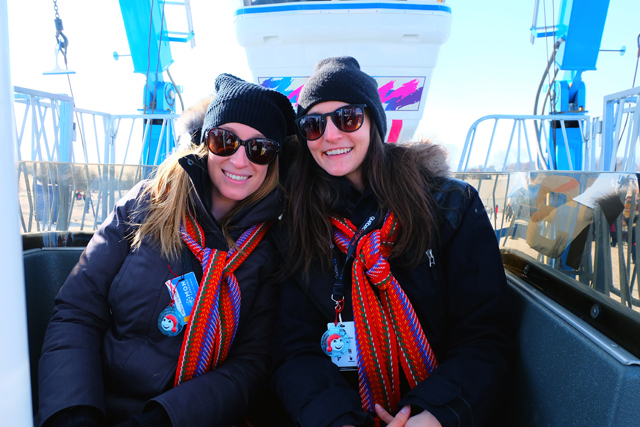 Thanks to Winter Carnival, Québec City Tourism, Quebec Region & everyone else who made this weekend possible!